Switzerland. Synonymous with? Adventure. Mountains. Sophisticated, historic cities. Watches. Chocolate. Swiss Mobility. Swiss Slow-Up. What? What the heck are Swiss Mobility and Swiss Slow-up? 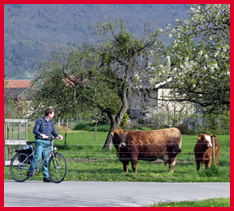 Swiss Mobility: Adventurous touring of Switzerland at, perhaps, its best. It's an invention of which only the Swiss could conceive. 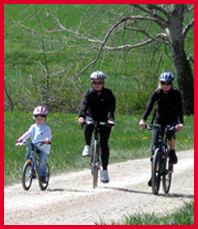 A network of trails cris-crossing the country, laid out for travel by biking, hiking, mountain biking, in-line skating or canoeing. Slow-Up: Swiss touring on wheels at, perhaps, its logical absurdity. Roads are closed to cars so that people can run a 30-plus kilometer circular course on anything that’s human-powered and has wheels. People of all kinds are Slowing-Up. Young ones. Old ones. Big ones. Little ones. Skinny ones. Chubby ones. I’d joined several others in Switzerland to road test Swiss Mobility by bike. Timing allowed the Slow-Up to become a logically illogical end the tour. People riding bicycles, in-line skates, scooters, skateboards, roller skates, tandem bikes. People walking. People running. People skating while talking on cell phones. Swiss Mobility’s trails reach far and wide. 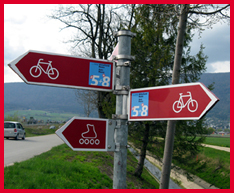 They're universally marked with consistent signage that tells you which way to bike, skate, walk or paddle. Teens on in-line skates being towed by teens on mountain bikes. The paths are laid out to accommodate all levels of challenge. Long and hilly. Short and flat. Everything in between. 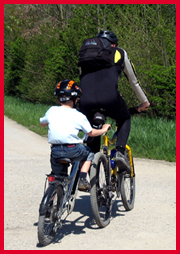 Children on attach-a-bikes whirling their little legs to keep apace with dad's pedaling. And, as if that's not well enough thought out, the whole system can be coordinated with the public transit system — trains, busses, ferries — which already operates with clichéd Swiss precision. Ride the train to your departure point, grab rental equipment (if you need it) at the terminal there, pedal/skate/paddle to your daily destination, and bunk for the night in any accommodation from luxe to guest house. Buy a SwissPass, and kids ages 6-15 and traveling with a parent travel free of charge throughout the Swiss Transportation Network, which includes rail, ferry, bus and many local transportation systems, plus entry to some 400 museums countrywide. People riding any and all things that come without power—except for the people in powered wheelchairs. Do it again the next day. If you set it up with the affiliated tour operator Swiss Trails, they’ll have your luggage carted for you. It was waiting for us upon our arrival at each hotel nightly. Young lovers rolling along hand-in-hand. Okay, it's true—I was a bit nervous. I hadn't ridden a bicycle in at least ten years. But, I was smart enough to buy some bike shorts before I left home. Best to pad an unconditioned bottom. We embarked from the rail station at Solothurn. Our bikes were waiting for us. Sturdy, reliable and seemingly brand new hybrids. My route of choice had been the Metterlands—the Midlands—Switzerland's relatively flat agricultural country that’s perfect pedaling for younger kids. Those who want to test their mettle in the mountains can find those kinds of routes, too. Bands playing at the roadside. We immediately found ourselves on a packed dirt path that followed the contours of the Aare River. The ground spurted only sporadically with pop-up rises. The pedaling was easy. Impromptu picnic areas selling sausage and pommes-frites. Even the local gas station on the outskirts of Murton was set up to serve the hungry, thirsty and tired. The sun shone, the river flowed, and we easily made our way to Biel, home to Swatch watches. Along the way, a stork manned a nest high on a farmyard roof; a swan family swam downstream with military precision; a young couple lolled along the river bank. Racing cyclists weaving like mad broken-field running halfbacks among the hordes. We next embarked for Neuchatel, an ancient little city on the banks of Lake Neuchatel. Immediately we rode among cows, sheep and the occasional horse. We followed now a canal, part of a system opened in 1880 for "water correction" that reduced the water level of the region's three lakes by three meters, drying large wetlands tracts to be transformed into farms. And allowing boats to travel freely among the lakes. We stopped at such a farm. Lindenhofh, a working farm, is an eco-award winning campground, where Hindrik and Liselotte Van der Veer raise vegetables, and RVers and tenters vacation and play in the nearby lake. Hindrik and Liselotte welcomed us with homemade apple juice and croissants served under blossoming cherry trees. It might’ve been nice to stay, but we peddled on. It was now Saturday. The paths were busy with families skating and cycling, and weekend warrior bike racers working on speed and distance. Entire families on in-line skates. Next came a nature preserve. And—what the heck was that!? The call of the cuckoo came from high in the trees. Holy cow—I always thought a cuckoo bird was a Swiss clock makers' invention. We detoured off the marked track to ride the boat to Ile St-Peter for an elegant lunch at Hotel St. Petersinsel, a winery/restaurant/hotel. A pair of horses grazed outside the window as we ate. Onwards through another nature preserve, alongside a highway, through a few more farms and finally to the Lake Neuchatel shoreline. There, we stopped "for a coffee" at a delightful terrace set along the water. Such a Swiss thing to do. Nearby, young children drove mini race cars on a tiny Grand Prix course. Guess they didn’t want to pedal. Neuchatel's population numbers 32,000. It seemed much larger. Built into a steep hillside, it maintains a medieval core, complete with narrow cobbled streets, steep stairways, tall masonry walls, and a Gothic church and castle sitting high on the hillside. Makeshift, roadside, outdoor cafes fill with people sipping Rivella, the national soda; dining on sausages and Gateau de Vully, the regional cake; listening to music, some live some canned. The final day began with a boat excursion across the lake. On the opposite shore, we faced a critical choice: go over the hill or around it? 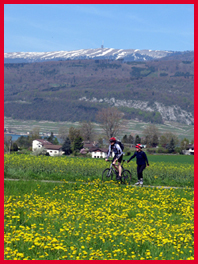 Having faced no serious climbs as yet, we chose to take the Mont Vully challenge. We left the national path for one maintained by the canton (the Swiss version of a state). Straight up the hill it went through cultivated fields. Only a 100-meter’s elevation gain, but no switchbacks. That’s steep. Then into a small town, where the right turn leading to Lake Murten was police guarded. No car traffic allowed down that way—this was the road to the Slow-Up. We lost those 100 meters at a high-speed coast. And then everything changed. We'd left the bucolic and serene behind. We joined the vast flow of Slow-Uppers. It was carnival time. A young lady with a tiny dog riding in a box on the back of her bike. After nearly three days of cycling through bucolic, flat landscapes given to agriculture and lined by rivers, canals and lakes, there I was—trying to go with the flow of a human lazy river on wheels; trying top pick a path among 50,000 rolling, pedaling folks. We reached Avenches, our final destination. Crowds of people sat on a stone wall while tunes from an oompah band and a jazz band mixed in the air. I went to investigate. Behind the wall lay a genuine Roman amphitheater. Amazing. I’d ridden far enough to travel fifteen or twenty centuries in time. At least a dozen or more Slow-Ups are staged annually in different Swiss regions. Roads are closed. All mobility is by muscle power on these closed-road, car-free adventure days. It’s madness. But, it’s fun. 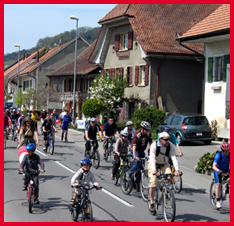 For normal bike/skate/paddle/hike travel, Swiss Mobility minimizes interaction with auto traffic, and Swiss Tours can set any kind of itinerary. Get there on Swiss International Airlines.